Best Ham and Potato Soup Ever! Do you have leftover ham? 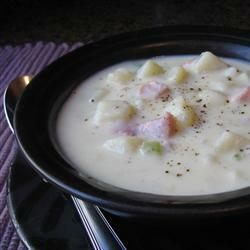 Make some ham and potato soup that warms the body and soul! This is one of those great frugal recipes that tastes like it came from a good restaurant. It’s a basic recipe that you can change to your taste or according to what you have on hand. Instead of ham you can use chicken, any kind of sausage, or no meat at all. Add just about any kind of vegetables; carrots, chopped onion, corn, green beans, and steamed broccoli are all good. You can even make it in the slow cooker–see last review below. Serve with crackers, crusty bread or cheese pizza for a hearty supper that satisfies. If you had a big ham for the holidays you can cube it to freeze. This recipe calls for 3/4 cup of cubed ham and makes 8 servings of soup. You could put that amount of ham in a freezer bag to use in this recipe or to throw into scrambled eggs for a super quick meal. Think about trying this recipe this winter. I think you’ll be glad to add it to your recipe rotation. Once you’ve made it you will know how to make any number of wonderful creamy soups like ones you’ve enjoyed in restaurants. Click here to link to this 5-star recipe at AllRecipes. Marie, isn’t it wonderful to be able to try all sorts of soups? Winter is a great time for it and you know what is in your soup! No preservatives and artificial stuff! Love it! Now that I’m retired, I’m trying out different soup recipes and this one looks great and yes we do have lots of leftover ham. You’re very welcome, Joe. I hope you enjoy this one many, many times! Talk about comfort food! Fantastic! I l.o.v.e. soup during cold weather months. Thanks for the recipe!